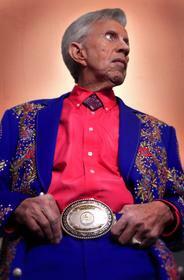 LOS ANGELES, CA -- (MARKET WIRE) -- May 2, 2007 -- Country Music Hall of Famer PORTER WAGONER celebrates his 50th anniversary as a member of the Grand Ole Opry on Saturday, May 19 with a special performance featuring WAGONER, Patty Loveless, Dolly Parton -- PORTER's longtime duet partner in the '60s and '70s -- and others. Marty Stuart -- who produced PORTER's upcoming CD "WAGONMASTER" (out June 5 on Anti-) -- hosts a one-hour segment of the evening's event to be televised on Great American Country's "Grand Ole Opry Live," starting at 8pm EDT. The Martin Guitar Company is honoring PORTER's half century with the Opry by introducing the Martin D-41 Porter Wagoner Custom Edition guitar. The visually arresting instrument is a fitting tribute to an artist instantly recognizable for his sparkling Nudie suits and flowing pompadour. Meanwhile, PORTER was "Committed To Parkview" this past weekend, as he shot a video with director Brian Barnes for the Johnny Cash-penned track. The first single from the forthcoming "WAGONMASTER" was hand-picked for PORTER more than 25-years ago by Johnny Cash (after having previously been recorded by Cash and with the Highwaymen). Marty Stuart explains: "In 1981, I was on tour with Cash in Europe, and I had a Porter tape and played it for Cash, and he and I got into a Porter listening marathon. And Cash said, 'I got a song for Porter, called 'Committed to Parkview,' -- because they had both been guests there -- and he gave me an envelope with a cassette in it to take to him. Well, we got home and I forgot all about it, but when we were choosing material for this album, I remembered and finally found it." Already, "WAGONMASTER" is grabbing critics' ears. Writes Alanna Nash for Amazon.com: "One of the major problems with modern country revolves around the fact that -- save George Jones, Merle Haggard, and Loretta Lynn -- almost all the characters who poured the foundation for post-World War II hillbilly culture are dead or no longer recording. Which brings us to the miracle of Porter Wagoner's new album, "WAGONMASTER"... a riveting collection of Southern Gothic numbers."